The Yellow Vests movement has faced shocking police violence. And it’s not just from a few bad apples: it’s part of President Macron’s strategy to silence protest. Since November 17 the gilets jaunes movement has been spreading across France. Protesters from all around the country are demanding fairer taxes, wealth redistribution, and more direct democracy, with demonstrations in multiple cities every Saturday. According to polls, the movement is supported by a majority of the population. The deaths mainly owed to road accidents, where angry drivers, blocked in their cars, drove over protesters. But one was caused by the use of police weapons: an eighty-year-old woman in Marseille was closing the shutters of her apartment when a tear-gas grenade hit her in the face. As of January 8, 5,339 people had been arrested, of which 1,234 were released with no further action. The following Saturday (January 12) eighty thousand police officers were deployed against fifty thousand protesters (official numbers). The police’s excessive use of force especially threatens the most defenseless protesters, as documented by numerous videos. These show a disabled man being dragged out of his wheelchair and thrown on the ground by a policeman, or a woman (who was also not resisting) being hit on the back of her neck and dragged across the floor, apparently unconscious, over dozens of meters. In this video, one can see protesters coming to the aid of a seemingly unconscious person on the ground, after he was hit by a water cannon, themselves being targeted by the water cannon and grenades. Not only protesters but also journalists have been attacked, threatened, and insulted by the police. A police commander recently decorated with the Légion d’Honneur (the highest state award in France) was also seen assaulting protesters. When triggered, these sting-ball grenades emit rubber balls into a radius surrounding the device. These offensive grenades are supposed to be used only when police are surrounded by protesters, to open up a way out, in the interests of self-defense. Yet eight hundred of these grenades were thrown into the crowds on December 1 alone. 339 of the sting-ball grenades used that day were the controversial GLI-F4 model. These latter are recognized as dangerous, even by police unions, as one of their older models killed protester Rémi Fraisse during demonstrations in 2014. The extreme tension is also visible in the use of dozens of armored vehicles in the streets of Paris, and in the spectacle of policemen with assault rifles at the demonstrations. The government is now sending special services such as the BAC (Brigade anti-criminelle) and armed police (gendarmerie) against protesters. These forces are not specialists in maintaining order; rather, they are usually sent to arrest and fight against dangerous criminals and terrorists. This has itself contributed to the escalation of violence. Protestors are regularly apprehended on simple suspicion. Left-wing activist Julien Coupat was arrested for thirty hours for the fact that in his car he had a yellow vest (which is mandatory by law! ), paint bombs, and a helmet. Some were arrested for having a hammer in their cars; vehicles are often searched without warrant. Such attacks against freedom to demonstrate were already made during the state of emergency implemented after France had been targeted by terrorist attacks. 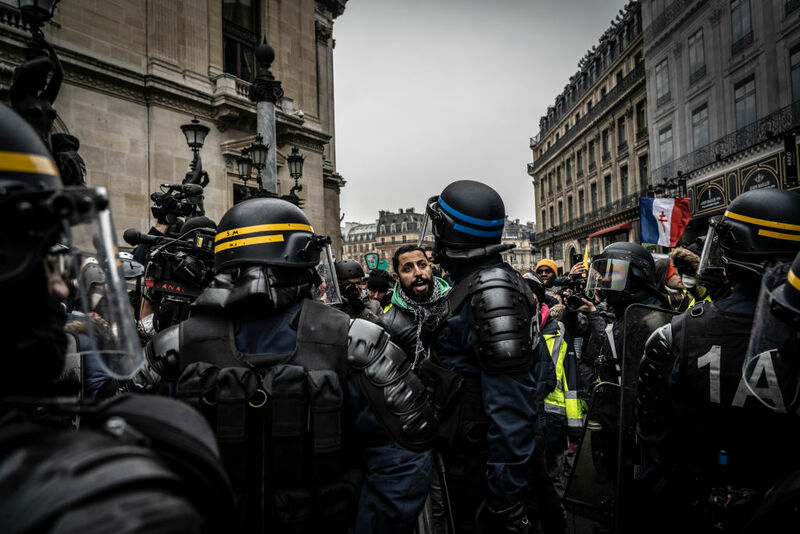 Environmental protesters were prevented from demonstrating during the Paris COP 21, and forced to stay at home, under the powers granted by the state of emergency. The question also remains open as to who will decide on who goes on the list of banned protesters. In the case of soccer hooligans, it was not the legal system itself but a special administration (with no similar independence) that decided: and this could clearly lead to abuses. Criticized even within Macron’s own parliamentary group, the government is unfortunately proceeding full steam ahead with these measures. In France’s Fifth Republic, the president has sweeping powers such as the right to legislate without a vote in Parliament (such as with the “decrees” already used by Macron for his Labor Law). While Macron only took 24 percent of the votes (among those who did vote) at the first round of the presidential election, his party holds 54 percent of seats in the National Assembly. Macron’s planned reform of the Constitution would concentrate even more power into the president’s hands, heralding a grim future for political pluralism in France. His reform promises to reduce the number of members of parliament by 30 percent, even though France already has among the lowest number of MPs in Europe relative to population. It will moreover limit the opposition’s right to propose amendments, and introduces only meager attempts to increase proportionality. This reform is related to the preparation of a new law against “fake news,” criticized by the entire opposition. Its vague definition of what “fake news” actually is highlights the threat it poses to free expression. Far-right leader Marine Le Pen’s popularity is still not decreasing in the polls, and she could even reach historic highs at the coming European elections. Yet beyond that specific threat, the perspective of a president-king Macron with weakened opposition is itself a frightening one. Doubts over the government’s transparency are fueled by recent scandals like the beating of protesters by then-Macron bodyguard Alexandre Benalla (recently found to be still in possession of diplomatic passports for his business in Chad), the Crase case (a friend of Benalla’s, seemingly paid by Russian oligarchs), and suspicions over Macron’s electoral campaign accounts and fundraisers. Juan Branco, a former legal advisor to Wikileaks, also reveals in his forthcoming book Crépuscule the shadow network which drove forward Macron’s presidential candidacy in 2017, made up of several billionaires owning France’s biggest media (Le Monde and Paris Match, for example). The gilets jaunes have taken an opposite approach, calling for democracy, less corruption, and less concentration of power by the central government. Some even call for the possibility of organizing citizen referendums, like in Switzerland. Jane H. Caelinnan is a France Insoumise activist.